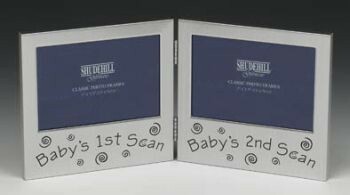 Laquer coated and tarnish resistant double hinged photo frame with 'Babys 1st Scan' on one side and 'Baby's 2nd Scan' on the other. Each half has frame measurements of 14cm wide x 13cm high. Takes 2 photos size 5" x 3.5" (13cm x 9cm). Bubble wrapped and boxed. The perfect way to keep your 2 precious scan photos and a lovely unique gift.